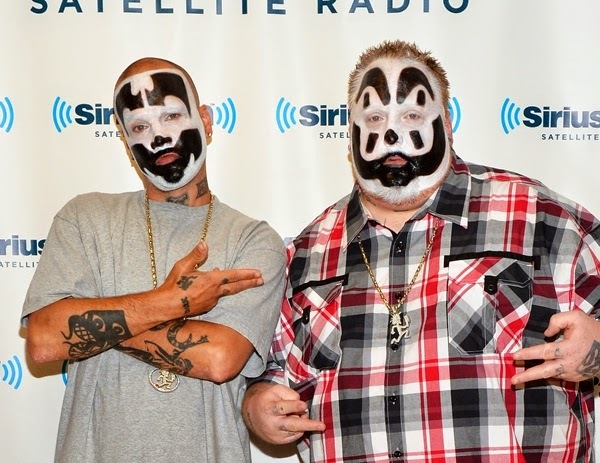 Attorneys for the FBI are seeking to get the Insane Clown Posse's lawsuit against the organization dismissed on grounds that the group should not be able to sue them. In 2011, the FBI classified the horrorcore rap duo's fans, Juggalos, as a gang akin to the Bloods or Crips. One year later, the rap group filed a lawsuit demanding to know how its fans were classified. On Monday, Justice Department attorney Amy Powell, representing the FBI, said the government is not responsible for how police use information in its gang report and that ICP has no grounds with which to sue, according to The Associated Press. "There is no general right of protection to a social association," she said with reference to the First Amendment violation that the rap group claimed protected its fans. Additionally, the "subjective chill" that plaintiffs, like fans who claim to have lost jobs, housing and even the custody of their children over their choice to listen to Insane Clown Posse's music, would not hold up in court. The FBI report in question described Juggalos as a "loosely organized hybrid gang" and claimed that the group's fans commit assaults, vandalism and occasionally serious crimes. The 2013 report did not reference Juggalos at all, Powell told U.S. District Judge Robert Cleland, who is handling the case. Saura Sahu, a lawyer representing four Juggalos, wants to keep the case moving, since, in his opinion, the report "went too far here." Michael Steinberg, Legal Director of the ACLU's Michigan chapter, said in a new video that the FBI "tried to wash their hands" of those who claim to have been affected by the categorization. "We countered that as a matter of law and logic, that the fault lies with the FBI," said Steinberg. "They can't expect to tell the world that the Juggalos are a gang and then say, 'Oh, it's not our fault when your rights are violated.'" Cleland commented that he felt the feds had an advantage in the case and expects to make a decision within 14-21 days.